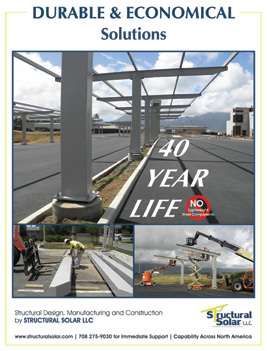 Structural Solar LLC is a leading design-build company who specializes in attractive and low maintenance solar carports for institutional, municipal and commercial solar installations. The highly attractive, yet low maintenance solar carports are also cost efficient alternatives to rooftop solar installations. The company manages the design, fabrication, coating and installation of foundations and “module-ready” solar structures, most notably solar canopies or carports in parking lots. Structural Solar LLC is a leading supplier of attractive and low maintenance solar carports to solar integrators developing university, hospital and other institutional and commercial solar projects where aesthetics provide an inspirational edge. The company has been recognized for award winning design on high profile institutional and municipal projects and can provide signed and sealed structural drawings for projects across North America. As a solar canopy company, Structural Solar designs to stringent specifications assuring durability and long term customer satisfaction. Moreover, Structural Solar provides customized curved and linear designs to meet the most demanding architectural requirements. The structures are designed to be low or no maintenance for 25 years. This is accomplished through careful design to minimize or avoid dissimilar metals, or conditions that would otherwise be favorable to galvanic cell reaction. According to the Structural Solar LLC’s president, Robert Pegnato who is a metallurgical engineer with advanced studies in corrosion resistant design, the company first seeks to design connections that reduce or eliminate the potential for standing water that might otherwise serve as an electrolyte in the corrosion process. Second, Structural Solar specifies either hot dipped galvanize (HDG) or a special 3 coat industrial – marine grade paint finish for the final product. While the inherent protection (“reactions”) from “HDG” and the 3-part paint finishes are vastly different, both finishes have been tested and offer superior results to common G-90 or conventional paint systems in normal corrosive environments. Accordingly, the company has become the premier solar canopy supplier for solar installations on the East Coast, Midwest and mid-Atlantic regions, and continues to grow across the US and Canada. Structural Solar LLC designs and builds durable, economical and low maintenance “module-ready” solar carports and canopies. For more information on how the company can make a difference in your project, call or visit the website of the solar canopy company who can get the job done, on time and within budget.